I have a dear friend visiting me all the way from London right now so I am in full-on show off the city mode. However even with me wanting to show her every restaurant possible, it’s still nice to have one night designated as an eat in night when the whole rest of the trip is eating and drinking out every other night. Sunday night is a great night to do a vegetarian dinner and I wanted to make something different so I could actually blog about something healthy for once (I know I’ve been quite remiss lately). And also of course I wanted to impress her (though she did sleep through the entire preparation process and almost did not wake up in time for our meal). When we were at some lovely markets earlier in the day, I was tasting bread and olive oil and dukkah at one of the stands per usual and decided I should probably actually buy some because I am constantly tasting and never buying. I love dukkah but have thought in the past its only use is really for dipping when you have bread, and because I don’t make bread that often I thought it might not be the most practical thing to have in my kitchen. However, turns out you can coat all sorts of things in dukkah – pork, salmon, and if you want to be all vegetarian – eggplant! I bought the dukkah from here and it’s utterly delicious. I want to cook with it all the time now. 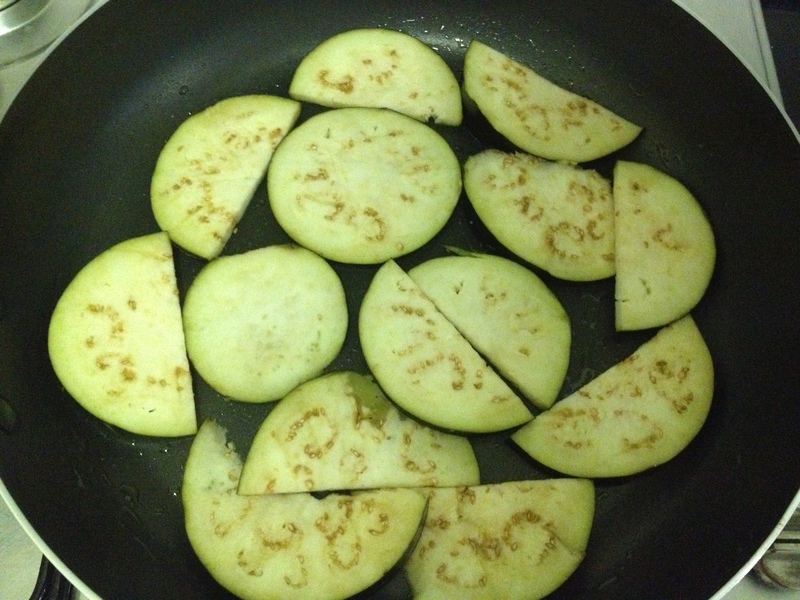 Eggplant lends itself particularly well to coating in dukkah since it’s quite a firm vegetable, but you could probably do it with slices of zucchini as well. I’m also excited for the next time I bake bread and have people over to dip it in olive oil and dukkah. Yum. I haven’t even mentioned the salad part of this meal, which is also amazing – who knew that roasting onions (definitely use red ones) could be so delicious? It’s really simple but the roasting of the tomatoes adds a depth of flavour to the salad that’s really well complimented by the cilantro. 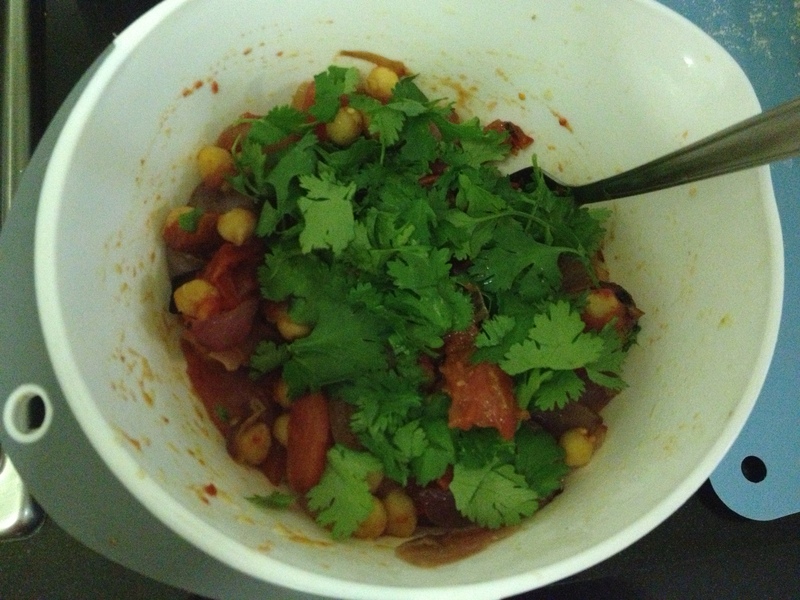 Now I know there are many cilantro/coriander haters out there, but you can easily modify it to your tastes. In summary: 1. buy dukkah and 2. make this salad. Enjoy! 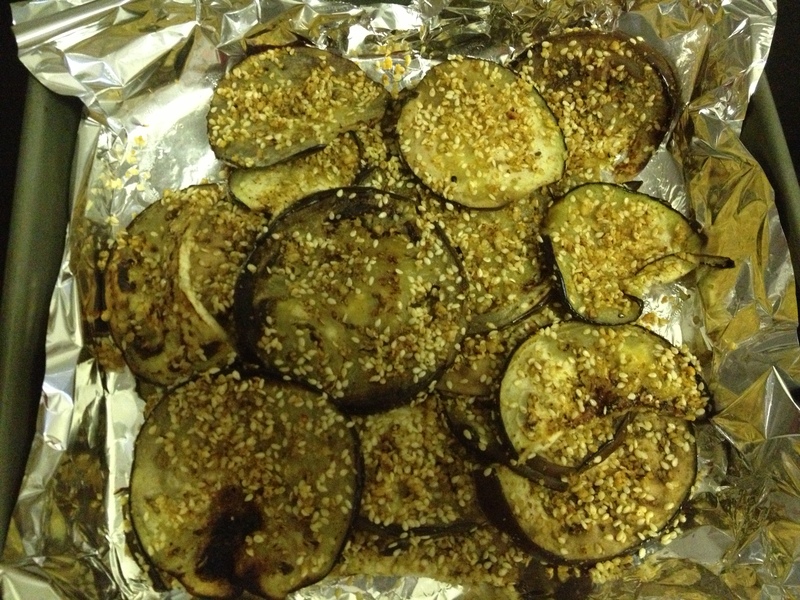 While the veggies are roasting, you can prepare the eggplant. 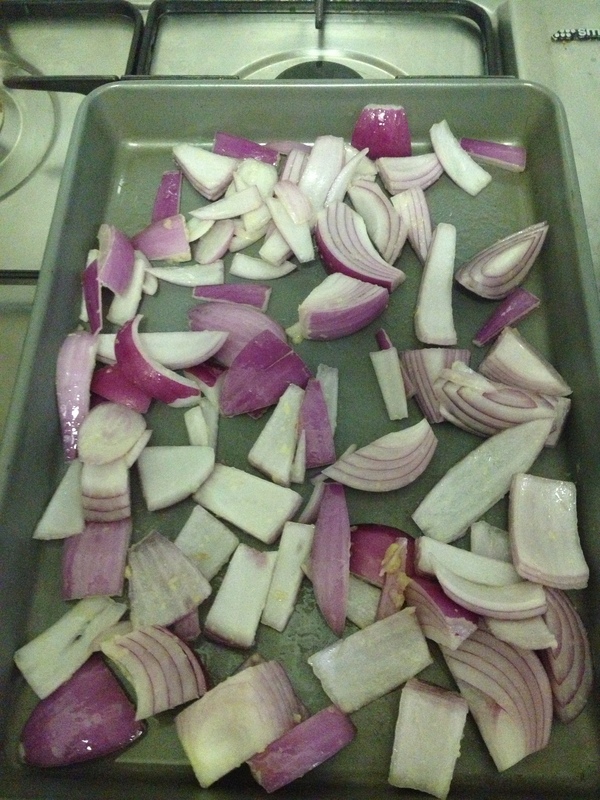 Have it sliced into thin rounds, and I just cooked them in a large pan that was coated with some olive oil. Let each one cook for a minute or two before flipping over. 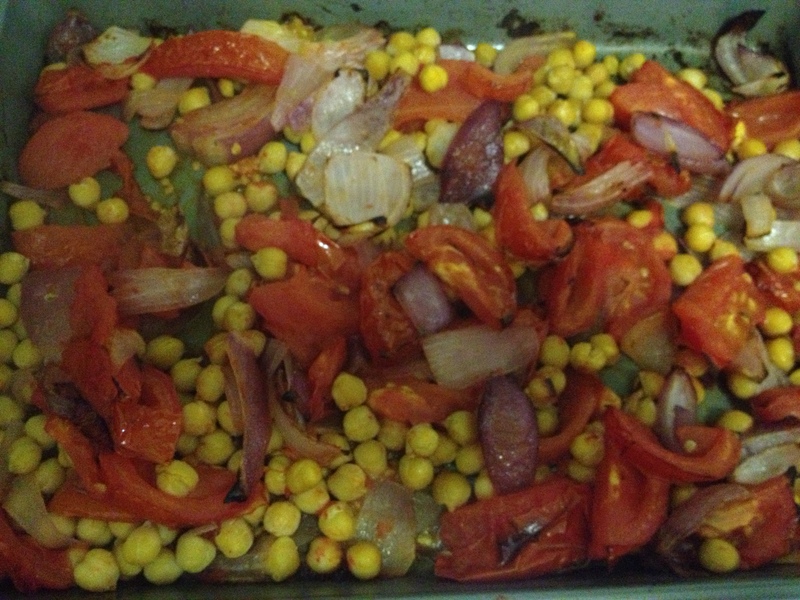 When done, dip both sides in the dukkah and place in a foil lined pan. You’ll have to cook them in several batches so once they are all in the pan, you can then just reheat them in the oven when you want to serve them. You can get creative in serving everything. 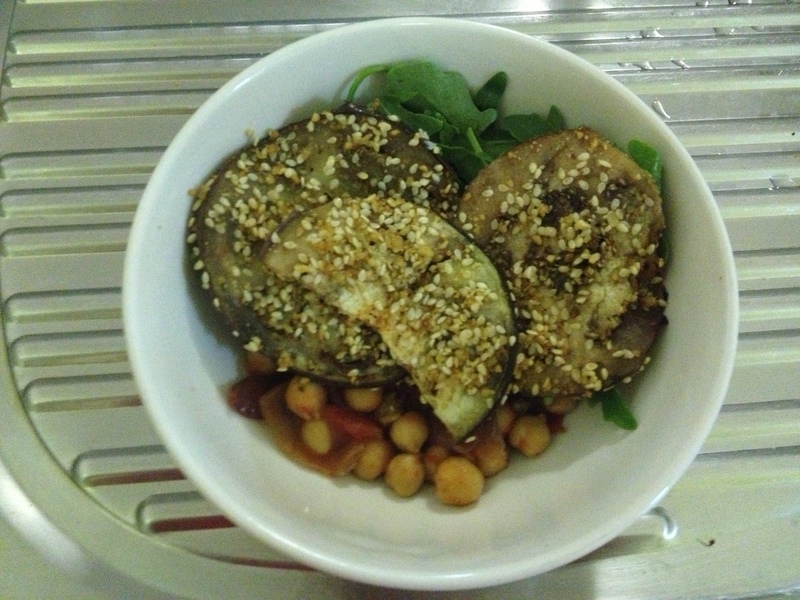 I put the chickpea tomato onion salad over a bed of rocket and put the eggplant on top and I found it flavourful enough to not need any dressing or anything. The original recipe suggests combining half a cup of Greek Yoghurt with a few squeezes of lemon juice and drizzling this over the top of the eggplant. The whole thing would be great with a few squeezes of lemon, or you could drizzle some olive oil and balsamic over the whole thing. Just do what you think will taste best! Serve the finished product however you like – I mixed the tomato onion salad with fresh rocket and then put the eggplant on top. Yum!